NOBLE Group said on Monday that it is not aware of any financial or material business issues that might have caused its recent share price decline and volatility, and intends to unveil its results and the PwC assurance report earlier to address allegations. The problem of this stock is there is too much publication on it, too much people watching it. People like to read what is happening on Noble Group, the more you read, the more you will not Sell while price is falling. Worse of all, some even bought it after they have read some good news about Noble. Well, as all of us know, we cannot win in every trade that we take, most importantly is you MUST know when to get out of a bearish trade. 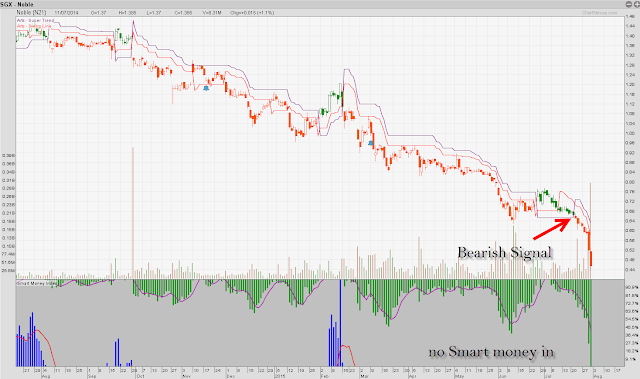 Supertrend system show a Bearish signal at $0.650, if you have followed you would have exit. So thing about this, do you have a strategy to prevent you from suffering big time in a Bearish market? Check out our previous post==> Did Noble make money for you?